A view of Etna (left) and life-changing torrone (right). All photos by Jason Gibb. Jason Gibb is one lucky man. When he's not tending to his olive trees, the founder of (maker of olive oil, purveyor of fine foods, organizer of tree adoptions) roots around Italy sleuthing and tasting the best the country has to offer (which is pretty damn incredible). He recounts his journey to discovery the history of the almond nougat torrone. 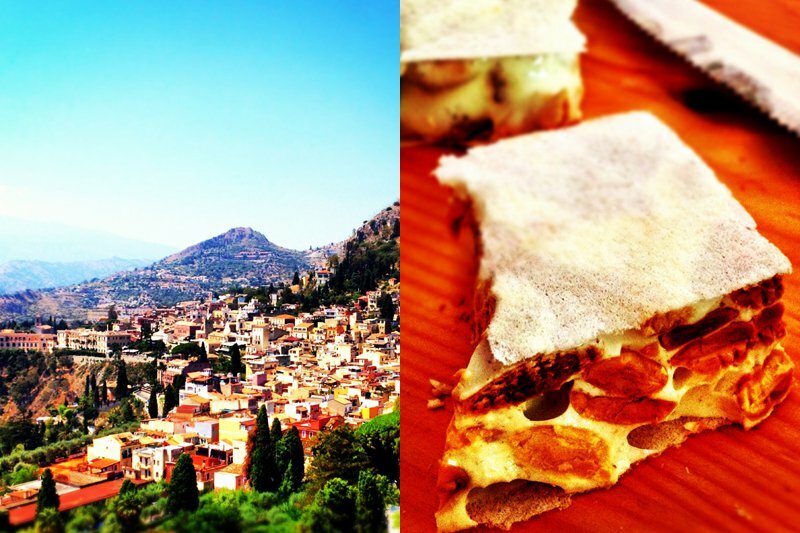 SICILY – I've been obsessed with food all my life. It began with learning to cook by my mum's side and has ended, so far at least, with me making olive oil for a living. My company is called , and our philosophy has always taken a love of food as its starting point. We make quite good extra virgin olive oil, we let people adopt our olive trees, and we also sell products that are made by some of the most skilled and passionate producers in Italy. This work has given me the opportunity — some might say the cover story — to obsessively seek out the best producers, the best products, and some of the best countryside that Italy has to offer. Jason and his daughter Rosie on a gelato research mission. It's a tough job, but somebody's got to do it. Recently I've taken more than a passing interest in torrone. I first fell in love with this almond-packed nougat when I started making it as a Christmas gift for friends and family. I loved how, by careful cooking, the honey and whipped egg whites would magically combine into something that would snap when cooled. Truth be told, it's quite tricky and painstaking to make, so I grab any opportunity to try torrone made by someone else. Torrone was originally created in Spain as turrón and only introduced into Italy in the last few hundred years. Now it has become a prized traditional Italian Christmas treat. Many parts of Italy claim torrone as their own. A torrone from the north, say Lombardia, is quite chewy and filled with pistachios and hazelnuts. The south produces a harder torrone with loads of toasted almonds. From a tourist trap in Rome, it will be sickly sweet and doused in chocolate. I recently picked up the scent of a story about someone who claims to have the original recipe that came from Spain hundreds of years ago. This led me on a journey to a remote part of southern Sicily, to a farm just outside the medieval town Ispica. Here I found Agnese Gradanti, and she told me her family's story in the shade of her carob trees. The grandfather of Agnese's grandfather was famous in his hometown of Giarrantana, a baroque village in the heart of the Iblei Mountains, for making gelato. She told me that the idea for gelato came from Arabs invading Sicily. They mixed local fruit juices with snow from the island's mountainous peaks to splendidly delicious effect. Two hundred years ago, Agnese's great-great-grandfather, Nonno Mario, the gelato expert, was coerced by a Spanish invader into making his turrón recipe. (Invaders can be persuasive.) The product was a triumph, and his torrone was soon so popular that he gave up his gelato business. 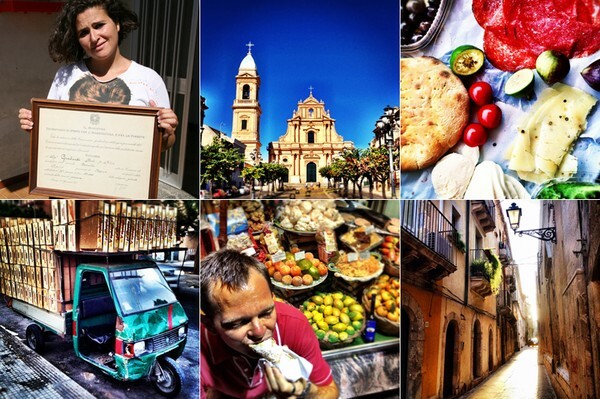 Various scenes in Sicily (clockwise from top left): Agnese holding her grandfather's certificate of merit; Ispica, the town where Agnese was born; simple lunch; a back street; Jason eating cannoli; an Ape loaded with wooden crates. Mario's recipe has been passed down the generations and today Agnese's mum and uncle work full time making the nougat. The secret of their recipe is a high concentration of organic almonds and honey from bees that pollinate their orange grove. As Agnese showed me around in the baking Sicilian heat, I began to understand better just why Italians love to talk about recipes. To them, recipes aren't remote things learned from celebrity cookbooks or Googled before dinner. Recipes record their history, and their ingredients tell us the stories of the people who have created them. Adopt an olive oil tree from . Этот полезный сайт , он описывает в статьях про www.velomarket.org.ua.